Clark has grown up in the western suburbs of Minneapolis, where he also currently resides with his wife Emily, along with their two sons and two daughters. Community involvement and volunteering has always been of great importance. 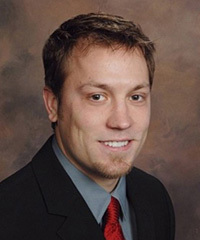 After graduating with a bachelors degree from the University of Minnesota in 2008, Clark began selling insurance - specializing in commercial insurance for construction contractors and manufacturers. Providing quality insurance products, sound advice, and superior service is what he strives for with every client. Clark is fully licensed and trained in commercial insurance for businesses, homeowners, automobile, life and disability. His favorite hobbies include basketball, hockey, water-skiing and snowboarding. Mattila Insurance Agency, Inc. is a chartered member of "Insurance Producers Network" and the insurance industry, "Trusted Choice" and "Independent Insurance Agent" organizations. After spending several years in the insurance industry, Lynnette took some time away from the business to raise her children. Returning to the insurance industry, Lynnette has an even greater appreciation helping to protect clients financial future and lives. Personalized service and attention is where Lynnette excels when working with clients. Lynnette's favorite hobbies/pastime include water-skiing, exercising and spending time with her family.